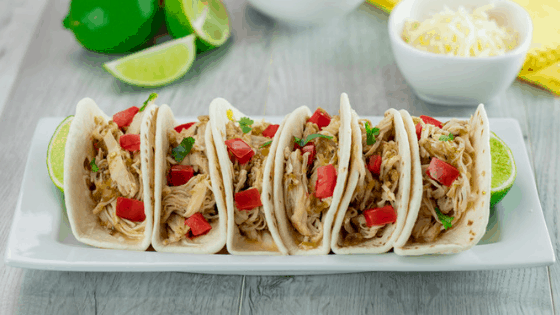 Delicious and flavorful salsa verde chicken tacos made in the Instant Pot or pressure cooker and served with tomatoes, cilantro, mozzarella cheese, and lime. One of my favorite things about my Instant Pot is that many recipes can be made by just dumping all the ingredients into the pot and start the timer. There’s no babysitting the stove or stirring to do. It’s great to be able to walk away from preparing a meal and tend to other tasks that need to be done. This recipe is so incredibly easy because everything gets put into the pot and it doesn’t take any work afterward except to shred the chicken breasts. It’s that easy! These salsa verde chicken tacos are packed full of flavor that is pleasing to the palate with zesty and tangy flavors. I serve these tacos on street taco tortillas. Street taco tortillas are a miniature version of taco tortillas so you’re able to stuff them with the delicious shredded chicken and toppings without getting extra tortilla. Every bite is more meat and less bread! I absolutely love them! I serve my salsa verde chicken tacos with freshly diced roma tomatoes, chopped cilantro, a slice of lime, and mozzarella cheeses. Other toppings that would be great with these tacos are diced avocados and fresh pico de gallo! Delicious and flavorful salsa verde tacos made in the Instant Pot and served with tomatoes, cilantro, mozzarella cheese, and lime. Add chicken in a single layer in the Instant Pot. Sprinkle garlic, oregano, cumin, salt, and pepper on the chicken breasts. Pour in the salsa verde as well as the lime juice around the chicken breasts. Close the lid and vent, set to MANUAL for 20 minutes. Allow a Natural Release for 15 minutes. Remove lid and chicken with forks or hand blender. Salsa Verde Chicken isn’t just for tacos! You can make casseroles, enchiladas, make it into a soup, or serve it over rice. Salsa Verde is very versatile!